VistaLab Pipette Tips - Available in Volumes Ranging from 0.2 mL to 10 mL, Bulk, Racked, Sterile. VistaLab Pipette Tips provide the perfect fit for your VistaLab, MLA and Ovation Pipettes. VistaLab Pipette Tips racks use up to 62% less plastic than other tips in the industry, and are now made of Number 5 recyclable materials (polypropylene), and can be recycled through typical programs for re-use. Saves costly reagents or enzymes. Reduced sample loss for higher reproducibility. Unaffected by detergents used in PCR or other biological applications. Certified for RNase/DNase and Pyrogen-free requirements. VistaLab Pipettes are 'Ergonomically Correct' and the perfect partners to VistaLab Pipette Tips. VistaLab Pipettes are the innovators behind the MLA and Ovation Pipettes. MLA Pipettes are ideal for clinical work and have been a laboratory tradition for over 4 decades. They are available in 3 models and cover a volume range of 10 to 100 uL. Ovation Pipettes are known for their amazing comfort, exceptional accuracy, and flawless tip mounting. The design of the pipette allows for decreased tension in the neck, shoulder, and elbows which drastically reduces the risk of repetitive strain injuries by preventing fatigue and stress to the wrist and hand. Ovation Pipettes have been specifically designed to reduce the risk of Carpal Tunnel Syndrome. VistaLab Pipette Tips are user-friendly and completely dependable, just like VistaLab Pipettes. 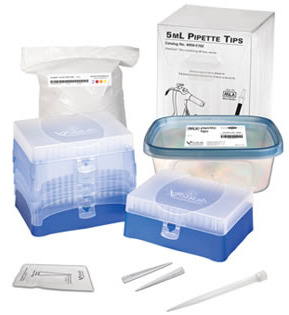 Pipette.com is an official distributor of VistaLab Pipette Tips. To find one that is ideal for your application, click on the pipette tips below. If you have any questions, contact 800-243-3232 or info@pipette.com. We maintain a large inventory of spare parts and are trained to calibrate and repair your MLA and Ovation Pipettes. We carry a full line of VistaLab reagent reservoirs for all of your multichannel work. A complete range of VistaLab Pipette Tips. A variety of sizes of VistaLab Wobble-not Serological Pipettes.